Wallpaper is not essential for decorating your home, though it has become an important method to bring style and colour into a room. It is a decoratively printed material, non-woven (paper) or woven (fabric), used to cover and decorate the interior walls. HISTORY - Earliest wallpapers in Europe date from the 13th century and were painted with images of popular religious icons. During the Renaissance tapestries were decorating the walls of the nobility. These tapestries were not only adding colour, they were an insulating layer to keep the heat in the room. Wallpapers became trendy with the middle class as tapestries were very expensive. It was in this period that the block printing became popular. The wallpapers were not always pasted on the walls, they were also installed loose on the wall as they did with the tapestries. High-quality wallpaper made in China, with a width of 1.2m, became available from the end of the seventeenth century, this was hand-painted and expensive. It was quickly imitated by European manufacturers, beginning with a printed outline and coloured in by hand. England and France have been since long the leaders in European wallpaper manufacturing. By the mid-eighteenth century, Britain was the leading wallpaper manufacturer in Europe. 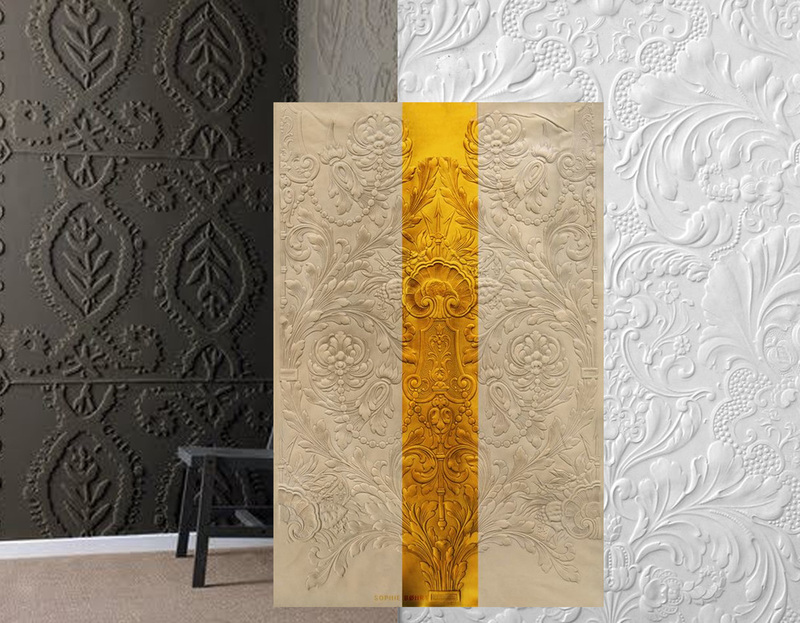 By the end of the eighteenth century the first machine for printing colour on wallpaper was invented by Christophe-Philippe Oberkampf and Louis-Nicolas Robert patended in 1799 a machine to produce continuous lengths of paper. In the beginning of the nineteenth century steam-powered printing presses were developed in Britain, allowing manufacturers to mass-produce wallpaper, making it affordable to working-class people. Wallpaper was making a huge boom, it was an effective and cheap way to brighten up the room. Wallpaper has gone in and out of fashion since the thirties of last century. In the twenty-first century wallpaper became again a decorative tool to define the style of the interior . TECHNIQUE - The main historical techniques, dating back to before 1700 are hand-painting, woodblock printing, stencilling. Later there were various types of machine-printing developed. Wallpaper techniques include gravure printing, screen-printing, rotary printing, and digital printing. Most wallpapers are designed so that the pattern repeats, this can go from a small repeat till a repeat which is almost filling half of the height of the wall. The hand-painted wallpapers often show a panorama, painted over several papers, often decorating the complete wall or even all the walls in the room. Modern wallpapers described as wallpaper may no longer actually be made of paper: woven fibres, cork, .... Thanks to digital printing photographs can be printed on large scale for wall murals, getting very trendy lately. Cylinder printing reduced the printing cost of the labor-intensive block printing, making wallpaper affordable for everybody. SIZES - In general wallpaper is sold in rolls. Depending on the origin there will be a difference in length and width. A European wallpaper roll will have a length of 10m, compared to 8.2m when it is printed in the United States. The classical width for a European wallpaper is 52 cm, so approximative 5 m2 per roll. This does not that mean that, when your wall has 9 m2 two rolls will be sufficient. It all depends on the height of your ceiling and the repeat of the design. Only when you have a height of 2,4 m and you take a stripe design that you will be able to use the whole roll. A design with a big repeat will make you have cuts which won't fit. INSTALLATION - It requires proper surface preparation before application, even minor wall defects will show. Putting first a cross-lined (horizontally) "lining paper" can give a better final result. Wallpaper is put on the wall with wallpaper paste, some economical wallpapers comes pre-pasted. After moistening the pre-pasted wallpaper or coating the wallpaper with wet paste, the wet surface is folded onto itself and left for some minutes so the glue can activate. REMOVAL - This is simple: brush the paper with water, the water will soak through the paper, saturate the glue and the paper can be peeled off. Unfortunately this does not work for vinyl wallpapers as vinyl is not porous. The wallpaper paste can also be dissolved by applying steam to the wallpaper. Using wallpaper in your home is perfect to define a style, atmosphere or to add color into a room. As I mentioned in the title: this was just an introduction to the fascinating world of wallpaper, so more Sample Room blog posts on this topic will follow.